This second volume contains Perkins's Commentary on Galatians. Perkins preached on Galatians each Lord's Day for over three years. Ralph Cudworth obtained Perkins's handwritten notes and edited them for publication. Because Perkins did not complete the commentary, Cudworth supplemented the manuscript with his own comments on chapter 6. This commentary of Perkins and Cudworth on Galatians first appeared in print in 1604, two years after Perkins's death. Perkins's other writings had already begun to be gathered and published. When the three-volume edition of his collected works first appeared, Galatians occupied over 320 large folio pages in the second volume (1609). It continued to appear as a part of several editions of the Works through their final 1635 reprint. Evidently, interest in the commentary warranted its publication again as a separate volume in 1617. 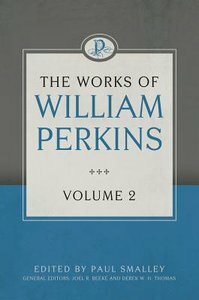 About "The Works of William Perkins (Vol 2)"
William Perkins (1558-1602) was an English theologian, and one of the foremost leaders of the Puritan movement during the reign of Elizabeth I. He was born the year that her reign began, and died less than a year before it ended. Perkins was a staunch proponent of Calvinist theology - particularly 'double predestination' - and the five 'solae' of Reformed Protestantism. Sometime in his early life he was made lame, and he had a religious awakening during his twenties while studying at Cambridge University, where he attained his MA in 1584, and was elected a fellow of Christ's College. Though not well known today, Perkins' writings became very popular during his lifetime and immediately after, outselling those of Calvin and other famous reformers. He would exercise a profound influence on many leading Reformed theologians, including Archbishop James Ussher, Richard Sibbes, and Jonathan Edwards.